Gaze and Focus. That is the theme this week. I keep thinking that I am not looking hard enough but as I write this and think about my standing poses and in particular Tree Pose tonight, I see that I did find moments of pure concentration. I must have or else I wold not have been able to get into this pose at all or hold it for as long as I did. In hindsight, I was looking for some big grand sweeping moment when in fact the moments are subtle yet no less powerful and strong. That makes me take notice of the subtle moments in my every day life that I want to take more notice of. I shared yoga with one of my favorite people and even though I wasn't "feeling" it at first, I didn't want to stop once I started. Sometimes the hardest part is starting. Vrksasana Tree Pose takes concentration and focus and best done with a smile. 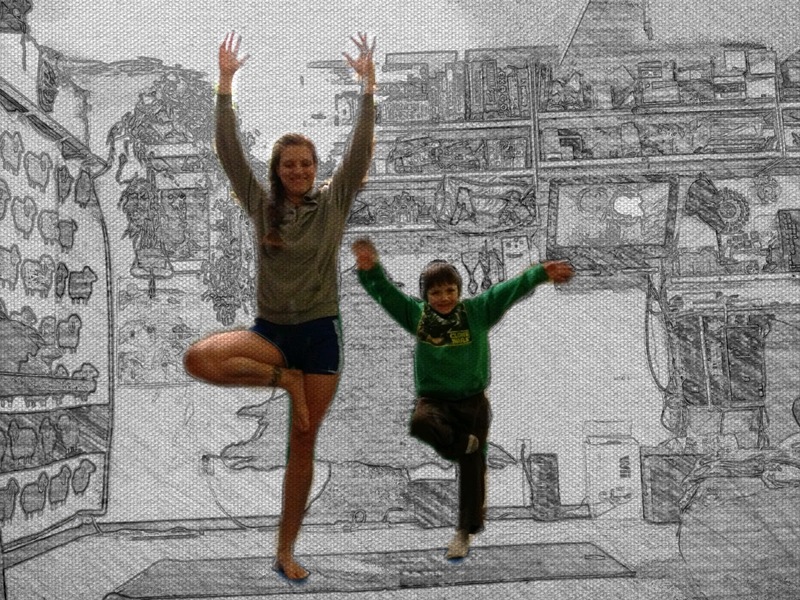 It was fun to try and balance for myself and little Milo. He did eventually find his roots and was able to stand on his own. He is always up for some yoga! I get frustrated with my clothing in this pose. Sometimes my pants or socks are slippery and its hard to keep my foot up. It was nice to wear shorts after I got warmed up. Its been crazy cold here and I long for warmth and sun. I have to stop myself from dwelling on it though. Longing for another time or place will just make me miss the moments I have right now, even if I am cold! This week is turning out to be the week of the dentist. All four of the spawn and myself will have gone by Friday. Mostly routine stuff but Oi, the dentist. Its making me tired and I am ready to have a day with some energy. Tomorrow is a road trip to Iowa City to the Pediatric Dental Clinic at the college for Jupiter. The clinic specializes in children with disabilities. It will be fun to road trip as the boys are all great travelers and I have two Yoga Journals to catch up on!